We first started seeing spy shots of the Audi RS5 back in March, when a blue and black test mule was caught tearing up the Nurburgring. Now, it looks like the RS5 is just about ready for it's international debut at next month's Frankfurt Motor Show. 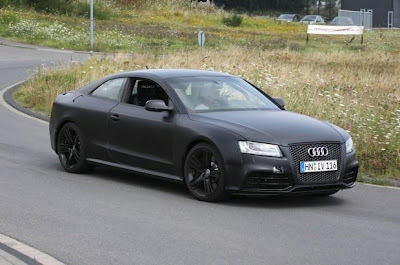 Here are the latest spy shots of the RS5, sporting a matte black paint job with little or no camouflage. As far as we can tell, original speculation of the RS5 sporting a 450 hp, 4.2 liter V8 currently found in the RS4 and R8 still holds true. We wouldn't be surprised to see Audi officially unveil the RS5 on the internet a few weeks prior to Frankfurt. All information Copyright © 2009-2012 quattroholic.com. All rights reserved. quattroholic.com - We're addicted to Audi. Quattroholic.com is a blog devoted to Audi news, spy shots, road tests, show coverage and more. This work by quattroholic.com is licensed under a Creative Commons Attribution-NonCommercial-ShareAlike 3.0 Unported License. Quattroholic.com is an independent media publication and is not affiliated with or endorsed by Audi AG and/or quattro GmbH. Quattroholic.com is not affiliated with or endorsed by Volkswagen Group and/or Volkswagen AG and it's brands. Theses brands include Volkswagen, Audi, Porsche, Bentley, Bugatti, Lamborghini, SEAT, Skoda, Scania and Volkswagen Commercial Vehicles. Audi™, quattro™, Avant, Tiptronic, FrontTrak, A1, A2, A3, A4, A5, A6, A7, A8, S1, S2, S3, S4, S5, S6, S7, S8, TT, TT S, TT RS, R8, R10, R15, RS1, RS2, RS3, RS4, RS5, RS6, RS7, Q3, Q5, Q7 and allroad quattro are trademarks of Audi AG.